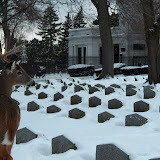 Almost a year ago, one of my Forrest Lawn postings was about the famous Forrest Lawn buck, and his guarding of a goose and her goslings, while they incubated and hatched. The story of nature's simple beauty and dignity was often included on local news reports, and Forrest Lawn went so far as to install a 24 webcam for people to watch the mother goose and her deer protector. 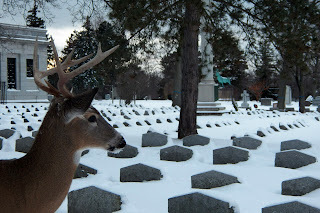 I've come to better know Felix on my runs and photo taking in the cemetery. 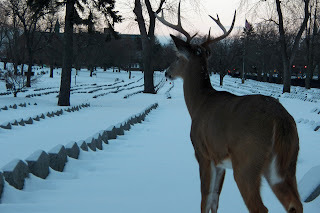 Two weeks ago, with a fresh coat of snow over the cemetery, I found Felix by one of the cemetery's main gates and, coincidentally, a monument with a statue of a buck-- and it just so happened I had my camera. These are the results. 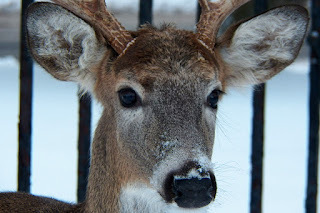 He stayed still-- and not, it seemed, out of fear-- he seemed more curious in exactly what my camera was, and did not mind having the lens zoom in and out and so close to him. While photographs of a deer in the cemetery aren't exactly related to Halloween, Felix is a large part of what makes historic, majestic and fascinating Forrest Lawn the place that it is. I hope you'll indulge me.